WILLEMSTAD - Curaçao and Italy are the second and third teams to qualify for this year’s Senior League World Series, scheduled for Aug. 2-8 at Mansfield Stadium. Liga Pariba of Willemstad, Curaçao won the Latin America qualifying tournament over the weekend, edging El Salvador 1-0 in the final to emerge from the 14-team regional in Yauco, Puerto Rico, undefeated in five games. Curaçao defeated Puerto Rico, Saint Maarten and the U.S. Virgin Islands during pool play before handling Venezuela 14-2 in the semifinals. 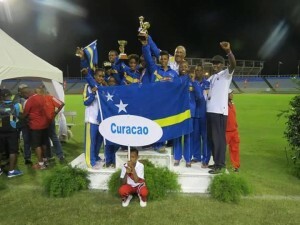 Curaçao will be one of the favorites in the 10-team SLWS field. Latin American teams are 54-17 in Senior League World Series play since the event was moved to Bangor in 2002. The Pariba team will be back for the second straight year after advancing undefeated to the 2014 world championship game where it fell to West University Little League of Houston, Texas, 7-4. A rival Curaçao program, Pariba L.L., won the 2002 Senior League World Series, reached the 2003 semifinals and played in the 2008 title game where it lost to North Cumberland Little League of Upper Deerfield, New Jersey. Curaçao teams that have appeared in Bangor have sent several players on to Major League Baseball, among them current Los Angeles Dodgers closer Kenley Jansen, Baltimore Orioles second baseman Jonathan Schoop and former National League all-star Jair Jurrjens. Curaçao will open play in the 2015 Senior League World Series against the U.S. East champion at 8 p.m. Sunday, Aug. 2, under the new modified double-elimination format being used for the tournament. Lazio, Italy, will make its first appearance of the 2015 SLWS at 2 p.m. Aug. 2 against Asia-Pacific champion Commonwealth of the Northern Mariana Islands, which earned its berth earlier this month. Italy won the four-team Europe-Africa championship by defeating Belgium 9-4 in Saturday’s title game at Novara, Italy. That capped off a four-game undefeated run through the regional during which Italy outscored its opponents — which also included the Netherlands and Spain — by an average of 8.2 runs per game. Emilia, Italy, went 1-3 in SLWS pool play a year ago. The host Maine District 3 champion will be the next SLWS qualifier to be determined, either Tuesday or Wednesday evening, while the Canadian national championships and the U.S. Central, East, Southeast, Southwest and West regionals all will get under way this week. The opening game of this year’s Senior League World Series will match the U.S. West against the U.S. Southwest at 11 a.m. Aug. 2.